This pressure cooker recipe gets you a full meal of meatloaf and mashed potatoes all cooked at the same time in this one-pot meal, leaving you with little cleaning to do afterwards. Layer the potatoes in the bottom of the pressure cooker, top with the trivet, and rest the meatloaf cradled in foil on top of the trivet. Cook for 22 minutes and your meal is ready in less than an hour! The pressure cooker really cuts back the cooking time for meatloaf, which would usually take at least an hour to make. 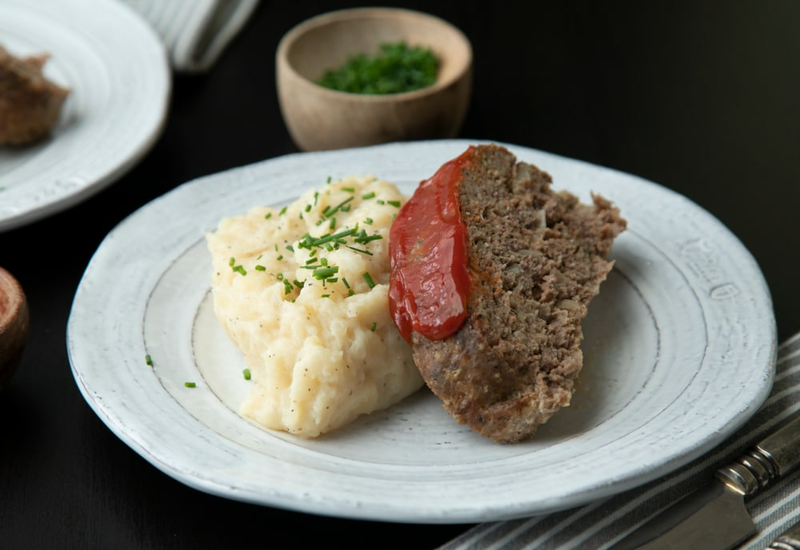 For a slightly different finish to your meatloaf, brush ketchup over the top of the loaf and place under a hot broiler for 5 minutes. Per Serving: 618 calories; 23g fat; 58.4g carbohydrates; 44g protein; 168mg cholesterol; 1426mg sodium. The mashed potatoes turned out great, but I had to finish cooking the meatloaf in oven. The meal turned out good, but required a little more work than expected. I tried this recipe and made a few simple changes, like using a homemade ketchup made from brown sugar and tomato paste, and also using sour cream in the mashed potatoes. I also used Worcestershire instead of soy sauce in the meatloaf. This was delicious, and being able to make it in my pressure cooker all at once was such a breeze. I used my own meatloaf recipe, which uses ground beef, onion, freshly minced garlic, and dried parsley. The recipe turned out great, I LOVE being able to cook both the meatloaf and the potatoes at the same time. This is a great recipe for working moms, single moms, etc. I skipped the onion for the meatloaf and used ground turkey to make this recipe family friendly. My husband isn't a big red meat eater. The ketchup finish on the top is a must, isn't this how everyone does it?! This is a great dinner that's filling and delicious. Meatloaf and potatoes take forever to cook, so the fact that I was able to cook both at the same time in the same pot was wonderful. Best gift ever, I love my Multipot! The trivet is the best accessory that comes with the Multpot! I love being able to cook the potatoes and meatloaf at the same time. I work crazy hours, and by the time I get home the last thing I want to do is slave over a hot stove. I can put this in, walk away, and come back to a delicious dinner! This was great! While I was finishing the potatoes, I placed the meatloaf under the broiler in the oven just to get the top brown. I used Worcester instead of soy sauce and might try a little Heinz 57 on the top next time. I love cooking the meat and potatoes at the same too. I love this one. It is so easy and we love it! My husband said it was the best meatloaf he’s ever had! I followed recipe exactly, except I did add a tablespoon of Worcestershire sauce. As reviewers above said; the meatloaf was not cooked through so I had to pull the potatoes and cook the meatloaf again at high pressure 9 minutes. Next time I will try to flatten it a bit more, and up my time cooking. I love that I can do the meatloaf and potatoes at the same time. They both came out perfectly! I used my own meatloaf recipe with different seasonings and Country Bob’s steak sauce to go along with the bread crumbs and egg. I also did my own topping under the broiler for 5 minutes. I made this recipe for the first time, I made it with an extra 1/2 lb of pork sausage so 2 lbs in all. I added 3 more minutes on pressure time it turned out perfect. Finished off under the broiler.. Potatoes were very creamy so happy with my Multipot. Too salty and did not hold together well. Followed the recipe exactly, and it came out great! However, next time I will tweak the recipe for fun. Will definitely make again- thanks! This was fun to make as well as eat. The only change I made was to let it “keep warm “ for 20 minutes instead of a quick release after 5 minutes and it turned out perfect. Delicious!! I followed the recipe exactly and it was absolutely delicious. It was easy too and will be making this again.